Make breakfast on the go with these portable yogurt apple bowls. Just carve them out with a melon baller, fill in with yogurt, granola and fresh fruit, and eat with a spoon. The best part? Eating the apple bowl at the end! 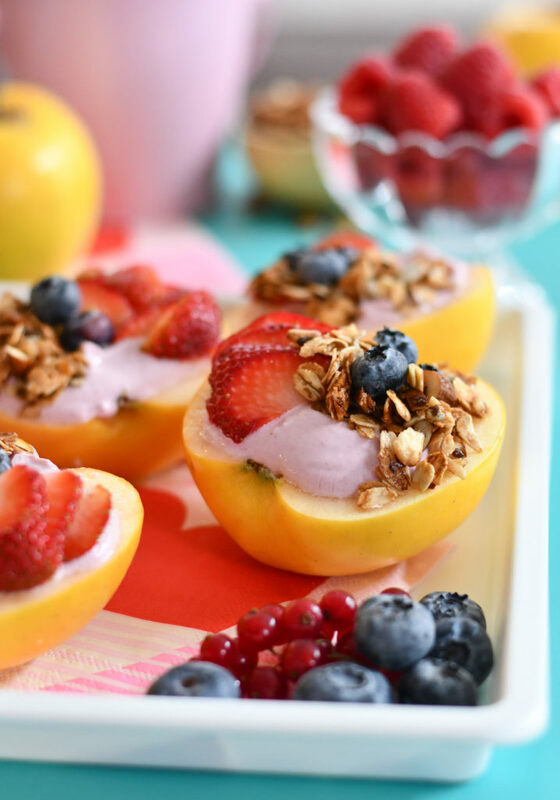 Making for a great start to your family’s morning, an after school snack, or even a sweet yet healthy treat this Valentine’s Day, these Yogurt Apple Bowls are a fun way to mix up and serve ordinary ingredients in a creative way. Using Opal apples gives you the best texture in any apple that you can use for this recipe. After scooping the apple flesh out, most apples would just get brown and mushy. Not Opals! These particular apples don’t get brown once its flesh touches oxygen, which means you don’t have to douse them in lemon juice to just keep them fresh. But don’t take my word for it; experiment in your own kitchen. I have and can attest to it! In fact I was able to slice one in half and keep one of the halves in the fridge overnight and wouldn’t you know it. It was still crunchy for eating the next day. Using a melon baller, scoop the flesh out of each apple half. Be careful not to cut through the sides or bottoms, leaving enough room to put yogurt inside. Add 1/4 c. yogurt into each apple bowl. Top with desired toppings. Grab a spoon and go! Another reason to love Opal Appless? Opal is known as the apple that gives back. A portion of every Opal sale goes towards youth-based non-profits, empowering youth to put their dreams into action and then serve those most in need within their community. Here at Fork & Beans, we genuinely believe in giving back so this is one apple we proudly support! To learn about Opal apples, where you can find them and the causes they support, visit their website here. This post has been sponsored by Opal Apples. All opinion and text are my own. OMG I love this idea. Also a great recipe for kids! ok these are the CUTEST and I want them for breakfast! I love that you used apples as the bowls, brilliant!